This year, we notably focused on handling policy & practices with a unique approach. However, conveying the features and benefits of synthetic biology as well as aquanting the people on iGEM is also a paramount responsibility of an iGEMmer; hence we accomplished additional work for outreach purposes. Primarily, we represented ourselves to the freshmen of our university to eblighten them about what synthetic biology is and what kind of work and challenges we face during our iGEM experience. We also introduce iGEM as the growing community of this field with its extensive registry of standard parts that increase in number each year. 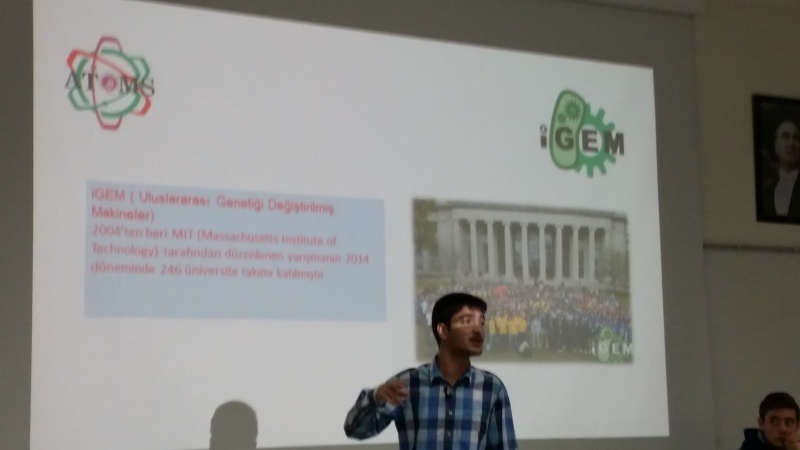 We mentioned about the history of our previous iGEM teams and what experiences they brought in so far. Eventually, we talked about our project “Change of Heart”. During our visit in Turkish Heart Society (TKV), iGEM is cited as the locomotive of synthetic biology industry considering its nature of encouraging young scientists to carry out their own work, which can be very useful to conduct promising projects especially in medical field. The Chairman of TKV, Prof. Dr. Lale Tokgozoglu, was pleased to hear about this field and the effort carried out so far. We also introduced our project and discussed the features, its possible impact on the field. We received very positive responses and praised to hear the beneficial aspect of our project. We also presented SynBio and our project to the Head of Department of Cardiology in our university hospital, Dr. Beyhan Eryonucu, and the cardiologist Dr. Bora Demircelik to discuss and criticize our plan and approach. We evaluated how we can achieve a better treatment method in the future in parallel with our proposal. Feedback was positive and helped us to retrace the design on P&P approach especially. We performed a workshop about synthetic biology called “SynBio 4 All” with the collaboration of Paris Bettencourt iGEM team in Turgut Ozal University International Medical Student Congress. The congress is the biggest and the most qualified medical student congress in Turkey with the highest attendance. By last year, over 1,500 medical students and experts attended our congress to present, learn and discuss new researches and treatments in medical field. Medical students all over Turkey join and present their scientific work which has been achieved throughout the year. Another fact is the international nature of this congress that experts, scientists and attendants from other countries have enriched the content and atmosphere of the congress. The impact on media and public opinion takes place in news and TV channels.